Our digital marketing experts will assist you to know how online platforms can have the biggest impact on your business reputation and in turn, affect your customer’s trust and loyalty to your brand. Building customer trust online is not difficult, but there are certain things to consider. 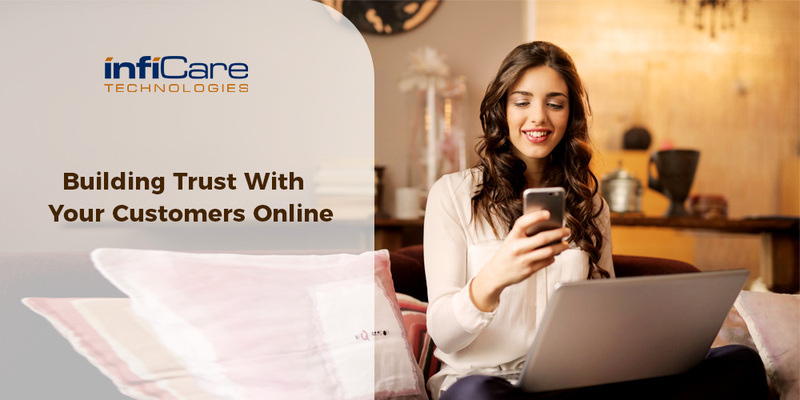 Our experts have mastered the art of building customer trust online and have helped our clients in building a good reputation. Let’s take a look at the mentioned below points. One of the best ways in which you can better present your business is the website. Your website should be such that it grabs the attention of the visitor and give them the required information which they must be looking for over the internet. In the sense, make it clear, concise, and ensure that trust signals such as customer reviews and testimonials are represented on the very first page of the website. Your website should speak clearly about what makes you different from your competitors. How are you getting ranked on the search engine results? What is the search engine showing up for your brand? The time your target audience searches for a product or service make sure you appear in top searches. If you find your competitors moving ahead of you, it’s time for you to invest in good SEO service providers. Google search can make or break a sale. So remember where you are and what are you ranked for. Is your Social Media presence strong? When we talk about making your business online, the very first thing that clicks in the mind is if the business is present and active on all appropriate social media platforms? If the answer is no, then you are missing out on a huge opportunity. Social media validate and elevate your brand in your customer’s eyes. It helps you to reinforce your brand message and build trust with your customers. Client’s Testimonials/Reviews plays a great role. Your audience might look for little reassurance from previous clients. Testimonials from satisfied customers can go a long way as it will help your potential audience in believing your work. This could be easily done by providing a section either on the landing page or on your website’s homepage. By tangibly proving the value of your products or services, you would be able to see an increased conversion rates. If you haven’t done it yet for your business, then it’s time for you to re-evaluate your brand’s online presence with each of these tips in mind to help build customer trust.